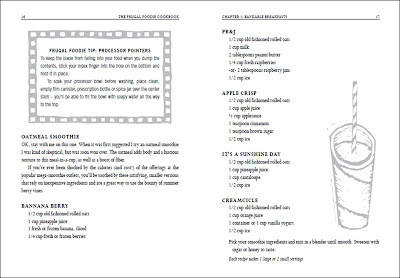 I just this week got to see the layout for the interior for The Frugal Foodie Cookbook and it looks FABULOUS! But something about the designer's name was ringing a bell deep in my brain... and then I figured it out, it was Frank Weidemann - who I worked with at Double Rainbow on Haight street way, way back in the late 1980s! 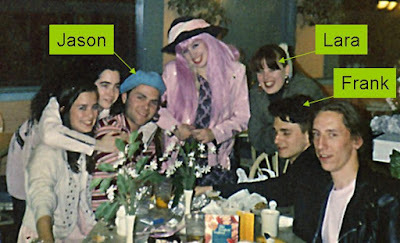 Oh the fun we had back then, serving everyone from druggies and the homeless to bridge and tunnel wannabe hipsters and San Francisco's version of the Von Trapp family. The crew also included Jason Mecier, who has gone on to fame (and I hope for him fortune) creating celebrity portraits in beans and noodles. 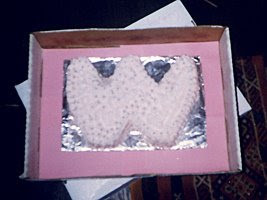 A Pretty in Pink "W" for Wendy the ultra-feminine birthday girl, adorned with the now-illegal silver dragees.